Dedicating time to smell your beer is key. For most food, the aroma is strong enough that simply being near the food will leave us with an enticing scent, and we can capture the nature of the flavor. Since beer aroma doesn’t project as much, sniffing a brew involves getting up close and personal− nose to the glass, swirl and breathe. Beer is typically rated using 4 criteria: look, taste, feel and smell. Smell adds to the distinct character of a specific style of beer. The aroma of a beer originates from a number of sources, which essentially comes down to the malt, hops, yeast and any additional ingredients added during the brewing process. Malts range widely in taste and aroma, and they typically define the beer’s character. We brew our American Brown Ale, the Boone County Brown, with four different types of malt, including chocolate, coffee and caramel. Smell from hops also fluctuates with the type of hops. Centuries of breeding have produced hop varieties that yield numerous scents such as floral, citrus or spice. The amount of hops used also affects the smell, which is where liberally hopped brews such as IPAs get their distinctively strong fragrance. Yeast also plays a role in beer aroma. Yeast produces esters during the fermentation process. These esters give off a fruity flavor and scent, and they vary with yeast strain. For example, the Hefe Weissbier, a German style beer, has hints of banana due to the esters released during its fermentation process. The Lily ale, named after the lilies that grow around the famous 350 year-old Bur Oak tree in McBaine after which our brewery is named, is our nod to the world of fragrance. 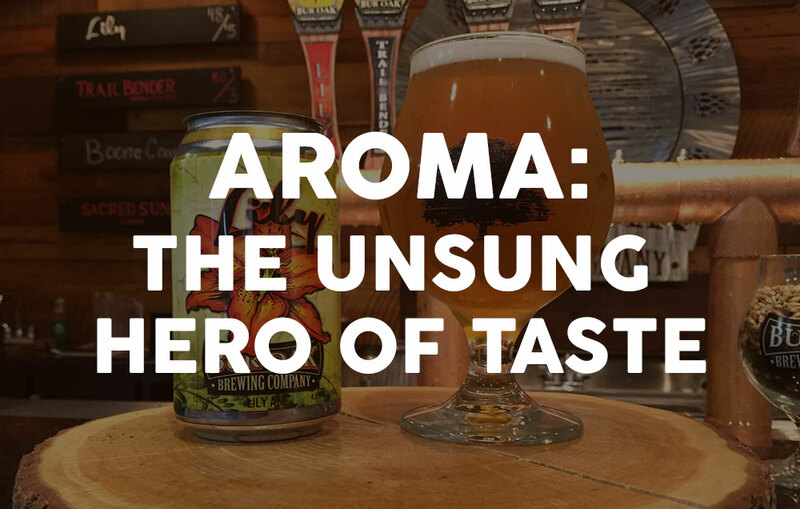 For the Lily, our team set out to craft a beer where smell shared center stage with taste. To accomplish this, we partnered with Makes Scents, a Columbia-based ‘custom fragrance’ shop. After many rounds of testing, the heart of the Lily was born. We fused orange and raspberry to create a soft, citrusy feel, as well as lavender to further enhance the aroma. These three keystones blended into the backdrop of a wheat ale make the Lily a powerfully attractive summer brew. So, the next time you get that cold pint of beer slid across to you at the bar, stop for a second before you dive right in. Place your nose near the glass, give it a bit of a swirl and inhale through your nose, noting all the distinct aromas that add to the flavor. We hope it adds to your enjoyment of the beer and appreciation for the craft brewing process.